When it comes to special cakes, I swing between two points of view. I love the creativity of a cake covered in fondant icing, and decorated with little figurines and all the bells and whistles, but I also find the simplicity of a more rustic cake really appealing. To mark my grandmother’s 90th birthday this weekend, we were under strict instructions “not to make a fuss”. So with that in mind, birthday cake wise, it was all about keeping it simple. How was your Pancake Tuesday? I was all set to make healthier pancakes last night, with yogurt and berries for a simple topping. But sometimes, the traditional option is called for. On a wet, icy evening, all I wanted was a plate of comfort food: fluffy hot pancakes topped with lemon, butter and sugar, and a big mug of tea. And the best bit? Leftover pancakes for breakfast this morning! If like me, you’ve still got most of your Christmas shopping to do, the chances are this weekend might involve a dash to the shops. Much as I love soaking up the atmosphere around town during the festive season, I don’t like buying gifts under pressure. Instead I tend to shop online, and also make homemade gifts. As a child, mince pies confused me. I thought they were cakes made with minced beef, and didn’t really get why people seemed to like them so much. Thankfully I’m a bit less clueless now! Despite enjoying baking, I’d never made mince pies before. The Christmas tree went up last weekend, so it seemed an appropriate time for a first attempt. I was pleasantly surprised by my first batch, but hopefully will make tidier looking ones next time. It’s the little things that make a big difference when it comes to a special meal. A pretty napkin, nice plates, fresh flowers. It doesn’t need to be fancy but, for me, a few little touches can really set off a meal. When life gives you lemons, make lemonade. Or so the saying goes. I tend to make lemon cakes instead, but the same principle applies! Lemons are always on my shopping list: I like to drink lemon juice with hot water and ginger in the morning, use lemon a lot when preparing salads and main meals, and love lemon-flavoured desserts. A tip when making the lemon curd: the recipe says stirring doesn’t need to be constant. However, I’d suggest not leaving the curd for too long to avoid a scrambled egg consistency. To get a silky curd, stir beyond the point of boredom! The curd recipe could be easily adapted to an alternative flavour. Citrus flavours are easiest but you could also try mango or passionfruit. I think by now anyone who follows this blog, or in fact anyone who knows me, will be aware that I like to mark things with cake…a lot. So, when a good friend passed his final professional exams, I thought cake seemed an appropriate way to celebrate his success and proceeded to make educationally-themed cupcakes, nerdy as that sounds! 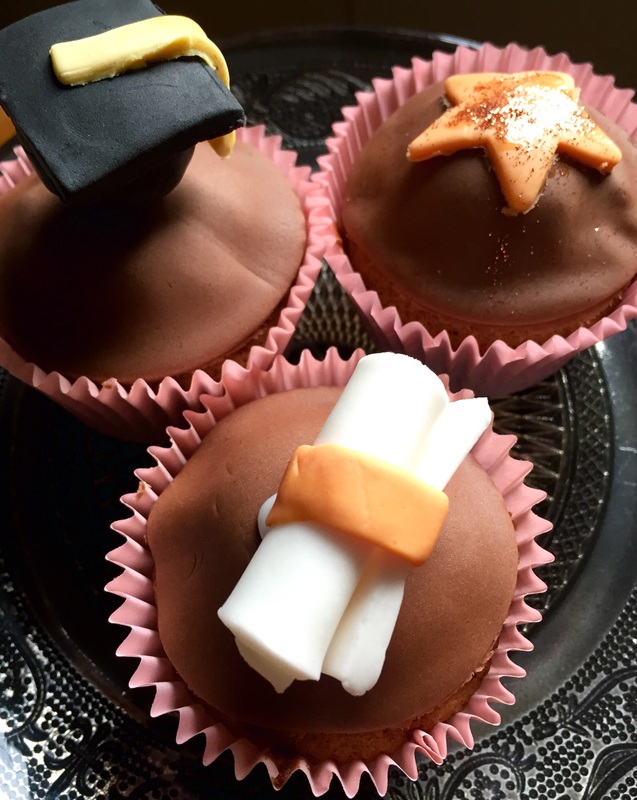 I opted for simple chocolate buns, topped with a layer of chocolate icing, Then I made tiny little mortarboards (the fancy graduation hats), scrolls and somewhat generic, congratulatory stars – albeit with edible sparkly dust. I quite enjoy the fiddliness of making things from sugarpaste, and find it very relaxing. I set up camp at my kitchen table, lay out my icing, tiny tools, edible glue and all the rest, and happily potter away. It’s a nice way to switch off! 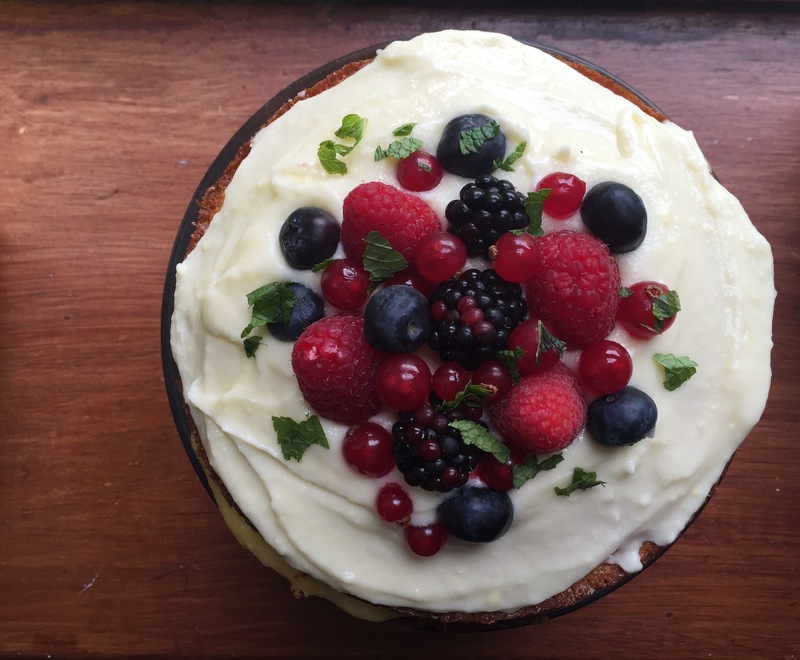 Every good celebration has cake as part of it: be it blowing out the candles on a birthday cake, setting a Christmas pudding alight with flaming brandy or the ceremonial cake cutting at a wedding. A big slice of cake is such a lovely treat, and can certainly put a smile on my face. A very lovely friend of mine had some good news to celebrate recently so I made her a cake to mark the occasion. 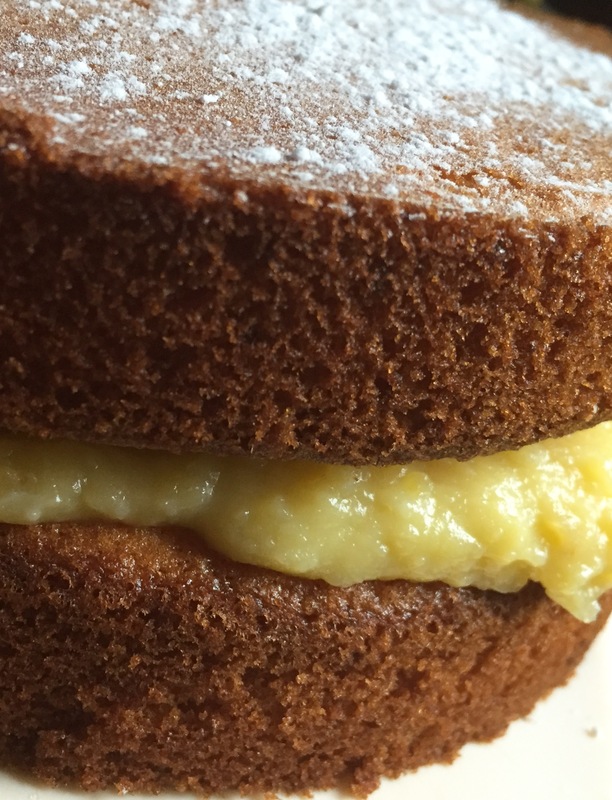 It was a mid-week catch-up so I decided to keep it simple, and opted for a lemon sponge sandwiched together with freshly whipped cream. 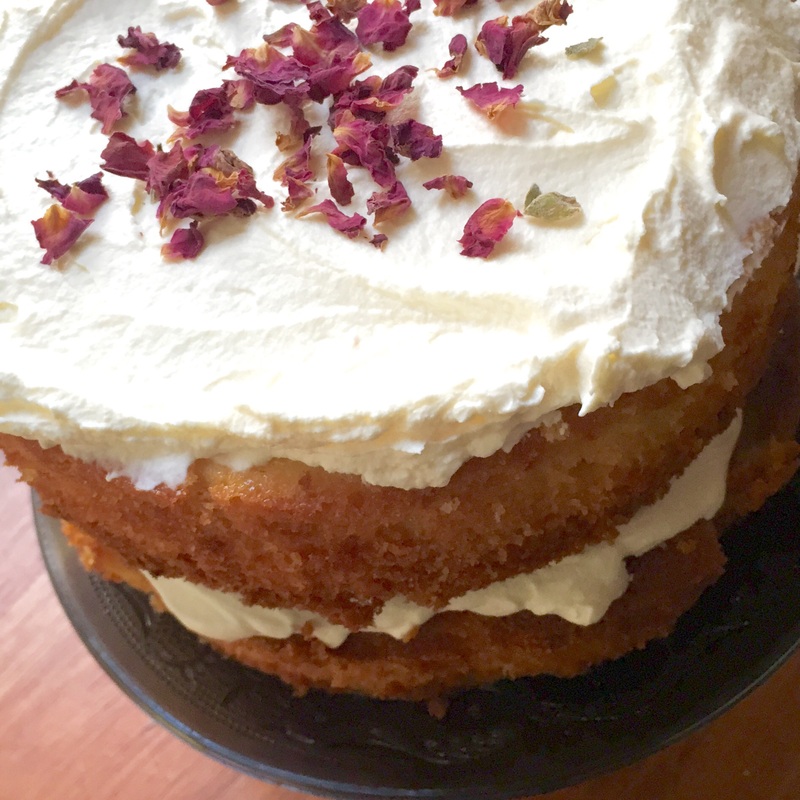 To make it look pretty, I scattered a few edible rose petals on top. 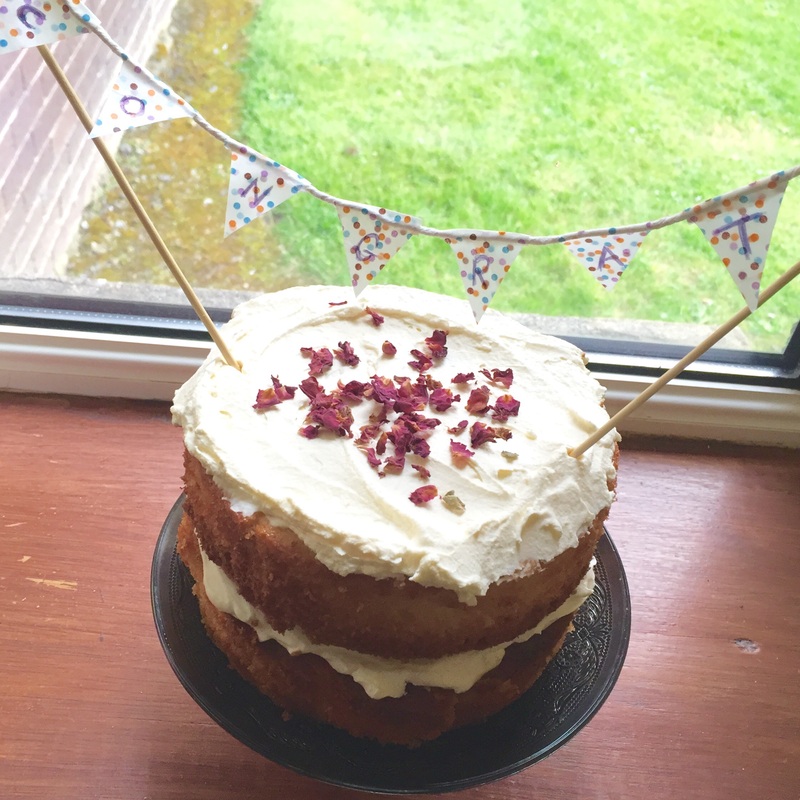 I’ve been meaning to try my hand at home-made cake bunting for a while after seeing some lovely examples of this simple cake decoration option. Two skewers, some string and some sticky tape later, I had a slightly wonky first attempt! My lovely little sister turned 16 a few days ago. She eats, sleeps and breathes camogie, playing for her school, the local club and the county. So it seemed fitting to attempt a jersey-themed cake for her birthday cake. I started off by baking a chocolate sponge in a rectangular tin. When it had cooled, I cut a strip off the top and sliced that in half to make the sleeves. Some toffee icing came next, before covering it all in red fondant with some white details (my sister’s club’s colours). To top it off, I made a little camogie player, complete with the number eight on her jersey in honour of the birthday girl. Unfortunately I smudged the little lady’s red lips when placing her on the cake!